Most Protestants immediately reject the idea of praying for someone who has already died. Their rationale, seemingly quite reasonable, is that, once a person has died, their fate in the after-life has already been determined. There is no point in praying for them now; what is done, is done. This is not the case for Catholic Christians. In saying that, I do mean just Roman-Catholic Christians, but all Catholic Christians. 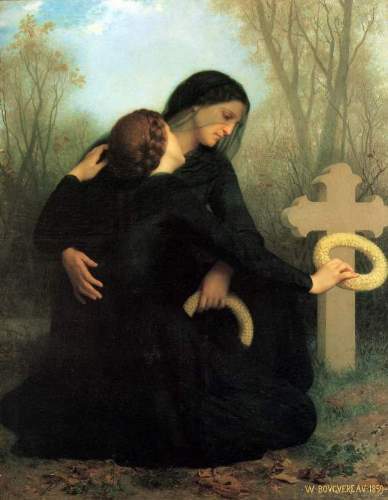 It is true that, in the Roman-Catholic Church, All Souls’ Day, November 2nd, is a day set aside to pray for all those close to us to have died because prayers for the departed, especially requiem masses, help speed a departed soul’s exit from purgatory and eventual entrance into Heaven. Roman-Catholics, however, are not the only Christians who pray for their deceased loved one and, in fact, the idea of praying for the departed pre-dates the concept of Purgatory by hundreds of years and exists in places and traditions of the Church that have never ever embraced any concept of Purgatory. Beyond that, the evidence of Christians interceding on behalf of the deceased is seen in many of the greatest Church Fathers and even in Holy Scripture itself. Similarly, near the end of that same epistle, St. Paul writes that Timothy should “Greet Prisca and Aquila, and the household of Onesiphorus.” (4:19) These are the only times Onesiphorus is mentioned in the Bible and he is exclusively referred to in the past tense. Likewise, there is no suggestion that Timothy should greet Onesiphorus himself, only his household. Clearly, Onesiphorus has already died at the time of composition of this letter and St. Paul has, himself, prayed that the Lord would have mercy upon him even though he has already departed this life. The Apostle Paul is interceding on behalf of his departed co-laborer. St. Augustine’s prayer would evoke a reference to St. Matthew’s Gospel wherein Jesus states, “Anyone who speaks a word against the Son of Man, it will be forgiven him; but whoever speaks against the Holy Spirit, it will not be forgiven him, either in this age or in the age to come.” (St. Matthew 12:32) This passage is one of the few that is used to establish the Roman-Catholic doctrine of Purgatory, but the two issues are not, as some suggest, inexorably linked. The Eastern Orthodox churches have never accepted or endorsed any doctrine related to Purgatory yet, nevertheless, have a very elaborate and ornate liturgy involving praying for the departed. Finally, the earliest extant liturgies include prayers for the deceased. In the Liturgy of St. James, perhaps the oldest extant liturgy, we find this passage included in what we would consider the Prayers of the People: “[For] the rest of the fathers and brethren that have fallen asleep aforetime.” This tenet of the Catholic faith is witnessed even in the 1549 Book of Common Prayer where the celebrant offered this prayer: “We commend unto thy mercye (O Lorde) all other thy servauntes, which are departed hence from us, with the signe of faith, and nowe do reste in the slepe of peace: Graunt unto them, we beseche thee, thy mercy, and everlasting peace, and that, at the day of the generall resurreccion, we and all they which bee of the misticall body of thy sonne, may altogether be set on his right hand, and heare that his most ioyfull voice.” Were one to investigate the 1979 Book of Common Prayer, they would find many references to prayers for the departed. In the Burial of the Dead virtually all of the collects and all of the commendatory prayers (including a blessing) are, in fact, prayers for someone who has already died. Prayers for the departed are an aspect of that faith which has been handed down by the Apostles and has been upheld by the Church Universal throughout all ages. The practice is Biblically supported by multiple verses and historically testified to by catacomb and funeral inscriptions from the pre-Constantinian era of the Church. The Church Fathers from the obscure Abercius of Hierapolis to Tertullian, St. Augustine, St. Basil the Great, and others lend their support to this tenet of faith and, finally, liturgies both Eastern and Anglican also testify to this matter. O God, the Maker and Redeemer of all believers: Grant to the faithful departed the unsearchable benefits of the passion of your Son; that on the day of his appearing they may be manifested as your children; through Jesus Christ our Lord, who lives and reigns with you and the Holy Spirit, one God, now and ever. Amen. For a collection of traditional Anglican prayers for the departed visit this page.